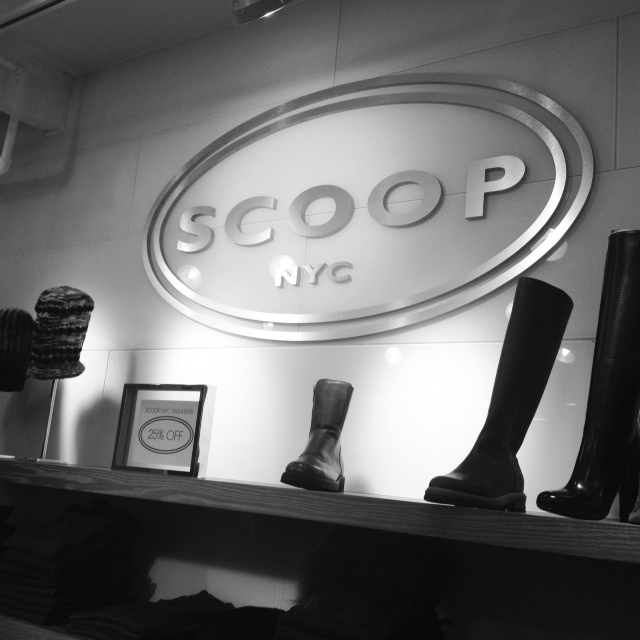 High-end womens- and menswear boutique Scoop NYC celebrated their one-year anniversary in Boston last Thursday. The evening also doubled as a charity event, in which fifteen percent of their sales went to Scoop’s philanthropy of choice. The Home for Little Wanderers has worked to create programs for family development and to keep children safe in their own communities. By seven o’clock, trendy shoppers were mingling inside the Newbury Street storefront. The atmosphere was casual, filled with trays of catered vanilla bean Georgetown Cupcakes and cocktails. Several photographers from Boston reporter The Phoenix drifted through the crowd snapping shots of Scoop’s artfully designed displays and the stylish attendees. Most were dressed for the fall season in shades of blue and black, with one woman arriving in spiked Christian Louboutin booties. During the event I sat down with a Scoop salesgirl to talk about upcoming fall fashion trends and the most popular pieces in the store right now. Her first trend spotting was denim or knit outerwear with leather sleeves. These jackets are both practical for the Boston weather and an incredible statement piece. Also, not surprisingly, after New York Fashion Week showed peplum pieces in almost every collection, the Alice and Olivia peplum dress sold out. Its universal fit flattered every body type and was a great LBD option. In addition, the back of the Scoop store boasts an impressive array of AG cords in amazing fall colors like wine, navy and forest green. The event ended later that night, as local fashionistas trailed out of the store onto Newbury street clutching their Scoop shopping bags. They purchased designer items while supporting a great cause, and I got the inside track on fall’s hottest trends.